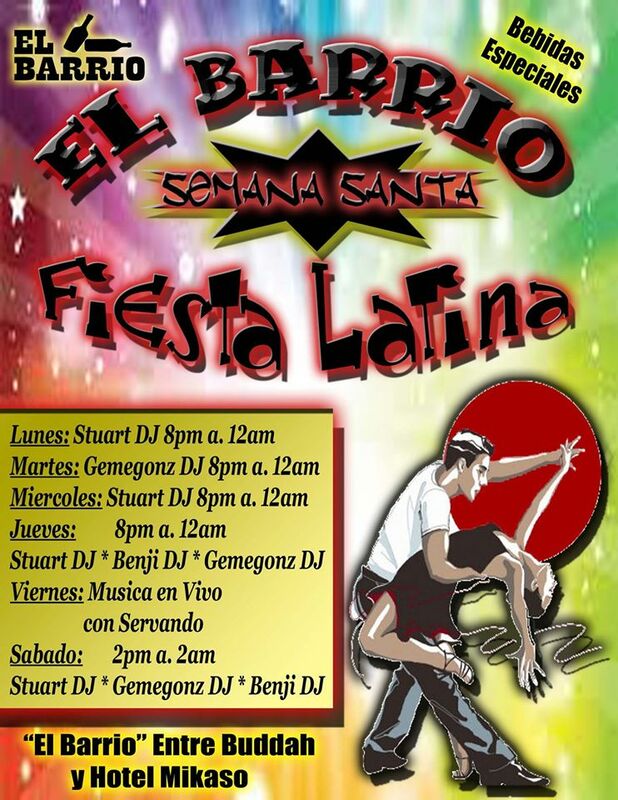 Alegre Pub has a DJ and party on the 24th and 25th. On the 26th, the band Los Descarriados will play. The Clover Restaurant has an Easter Special from March 24-27: Chicken Wings with a bottle of Gallo beer for Q40. Tin Tin is offering Pepian during Semana Santa. We don’t know what it means, but Chip and Dip Day is tomorrow, the 23rd of March, Alegre Pub in San Pedro la Laguna. This Friday and Saturday, El Barrio Bar hosts a May Day Fiesta to celebrate International Workers Day with DJs and food and drink specials day and night. San Pedro and the rest of the lake is filled with travelers from Guatemala as well as from around the world, all here to celebrate Semana Santa. Look for parades, bands and “flower carpets” in the main part of town, such as el centro (up the hill) in San Pedro. Across the lake, Circus Bar, Cafe Atlantis and Restaurante Casablanca have Semana Santa specials, with live entertainment at Circus Bar and Atlantis. Lots of parties, too. Tonight there’s live music at Zoola and Alegre Pub. El Barrio Bar’s “Fiesta Latina” kicks off with a band tonight and features live music or a DJ through the rest of the week. Lots of action at the new Paul’s Gaff, too. In the zona viva, people are partying in the street from noon until late. For something different, grab a liter of draft Gallo beer in front of Johanna’s Mini-Mercado. If you are here for Easter Sunday, head over to Smokin’ Joes’ BBQ at the pool on the way to the Santiago dock. Guatemala Independence Day Fiesta — The Main Event is September 15. Whenever you hear the local high school marching bands practicing day and night anywhere in Central America or Mexico, you know a big holiday is coming soon. Right now, everyone is gearing up for the September 15 fiesta to celebrate Guatemala’s birthday all over the country. September 15th is also the birthday of Costa Rica, El Salvador, Honduras, and Nicaragua, which all declared independence from the Kingdom of Spain in 1821. The nations of Central America were initially a union called the Federation (or United States) of Central America. #Semuc Champey: Bridge out on road from Antigua and Lake Atitlan, and road in bad condition too. The bridge over the Rio Cabohon is in such bad shape that vehicles can no longer cross it. Some people have been daring enough to walk across the main bridge to Semuc Champey in northern Guatemala, even though many planks have already fallen into the river. This is extremely dangerous, even more so because the nearest hospital is hours away even when the roads are in good condition. So if visiting Guatemala soon, especially for the national birthday and related festivals that culminate on September 15, check current conditions before going to Semuc Champey. Head for Lake Atitlan first, and go with the flow. See Lake Atitlan News for the latest on what’s happening.